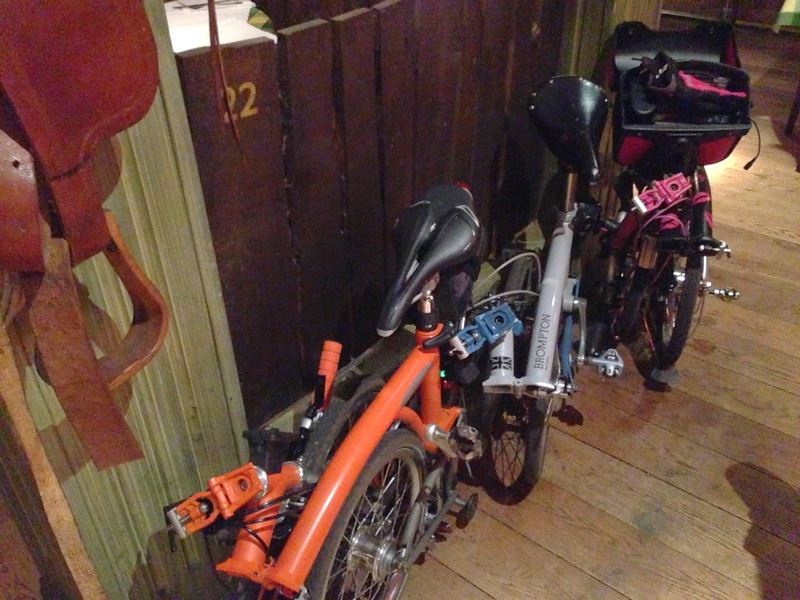 My Orange Brompton: There and back again! On Friday night there was the opportunity for another nocturnal Brompton cycle ride from Richmond to Box Hill and back. As I have several big rides coming up I thought it prudent to attend. Arriving outside Kew Gardens at 18:30 I was soon greeted by Jeremy, Anne and David. Other riders were meant to come but they didn't make it for one reason or another. We waited a suitable amount of time before making the correct assumption that no one else was going to turn up. The pace was brisk and at times clocked a good 18+ mph for long stretches over the first 10 miles. In truth I needed this and enjoyed the pace being set. I had decided to take my Titanium Orange Brompton with me and packed only what I needed. The only items I carried were a small saddle bag with basic tools, wallet, car keys and iPhone. Minimalism was the order of the day and it is something I need to get back to. Of late, I have been carrying far too much and need to get back to carrying a great deal less. This will certainly be true of some of the longer rides I refer to! Going through Bushy Park we saw signs that the park gates would be locked at 20:15. On our return this would mean a detour around, as we have done before however a little local knowledge was going to serve us well later on. Things didn't get really dark until quite late into the evening and although cloudy it remained dry for the ride, apart from some very light spits. The night was quite a warm one considering but that could have been the result of the pace we were cycling at. Leading up to this ride there had been a fair amount of rain and this was evident in what I will describe as the badlands. This is basically a narrow bridal track through a small wooded area. The ground had been churned up by horses leaving ruts, furrows, thick mud and the droppings of said horses. These had to be negotiated with extreme caution believe me! David and Jeremy were off into the distance while Anne and I took a more leisurely pace! The words, big girls blouse might have been used to describe my passage through the treacle-like mud. I had of course brought my Titanium Orange Brompton with me and bemoaning the fact that I was getting it dirty! (I really must get over this). Thankfully we made it through and the sense of relief was palpable, until it dawned on me that we would be coming back through it on our return!! The road leading to Headley is pretty steep in itself but the downhill afterwards was exhilarating. During daylight hours I may have descended slightly faster but in the pitch black and with lots of cars about, I decided to take things gingerly. Before long we reached the start of the run up to Box Hill. The sign - used for many a photo - was gone for some reason. David and Jeremy were first up and made it to the top in good time. David remarked that it was the fastest ascent he has done. I had a slightly different strategy for this ascent. Rather than power up at speed I had set myself the task of maintaining a steady pace for as much of the ascent I could. I managed about 7 mph all the way up and I did this as I wanted to see what state I would be in if I did. First, I found it quite difficult not to go up a gear or two and power off - perhaps expelling too much energy if I had. I found that I could easily maintain a nice rhythm and in doing so I didn't feel fatigued or out of breath. If I can have the self control to do this again, I am going to employ this technique for some of the big hills I will encounter on future rides - but the temptation to go as quickly as possible is hard to resist. Box Hill seems to get easier and easier each time we do it - everyone was in agreement. Anne was not that far behind and once we were all together we headed off to the 'Smith and Western.' 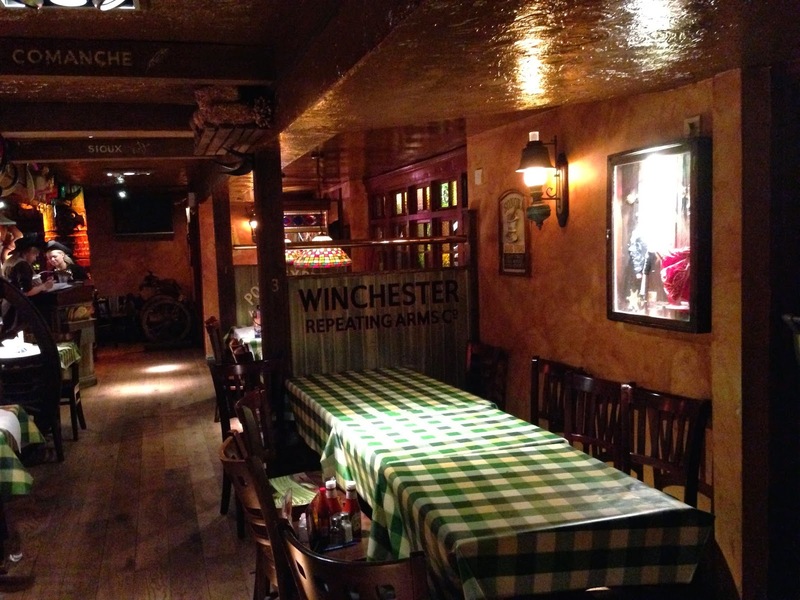 This is the most unlikely themed restaurant for this location but utterly brilliant. As you enter you are almost overwhelmed by the level of Americana. 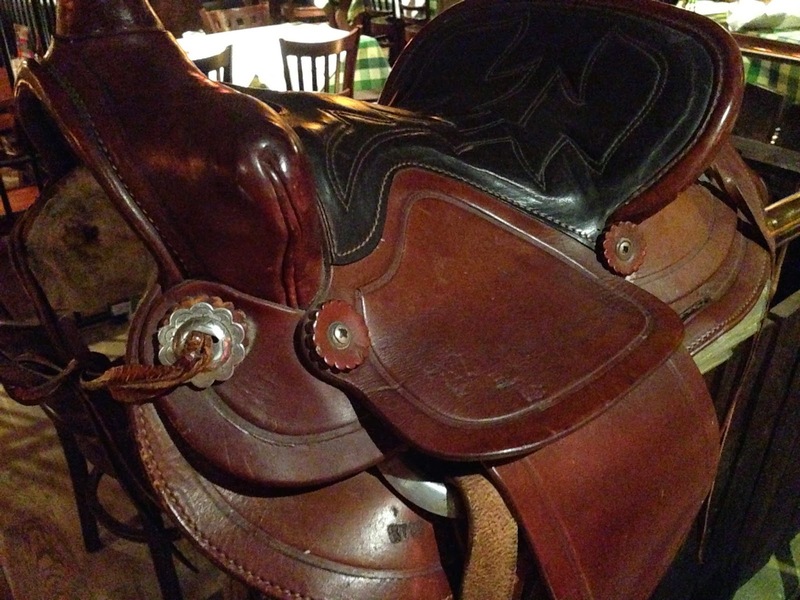 The music - country and western - is the first thing that hits you. 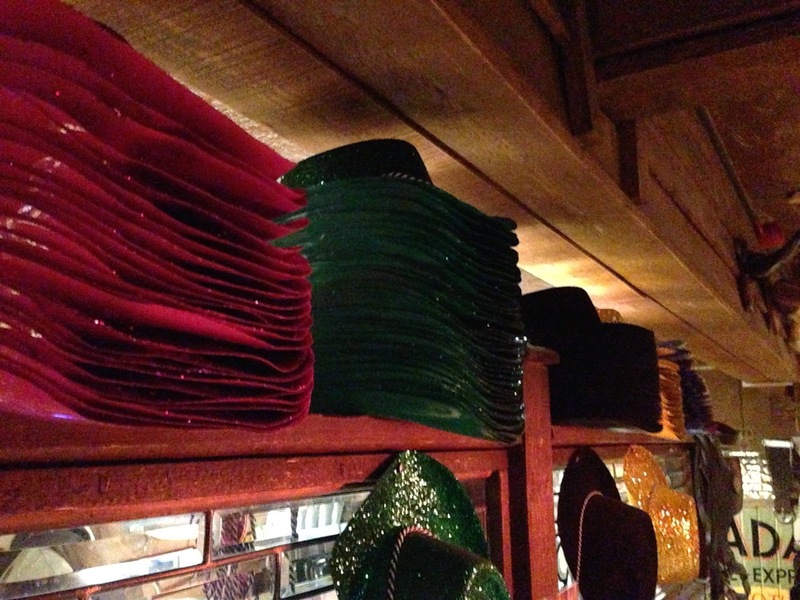 The staff are dressed in cowboy outfits. 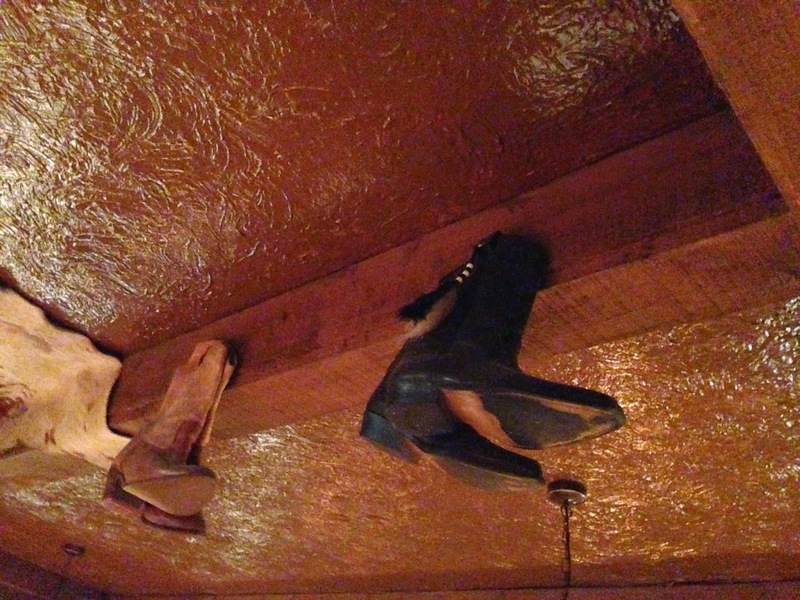 Cowboy boots are hung from the rafters as are ropes, Winchester rifles, hats and saddles. Wanted posters line the walls and there is even a gaol. It is worth a visit as I have neither seen nor heard of anything else like it. We ate our food - suitably American - and made our way outside. As always I instantly felt cold and wished I had brought some sort of extra layer. I made a mental note to do just this for next Friday / Saturday morning on a London to Brighton ride! The ride back was again brisk and if anything we could have all gone faster if we had of wanted to - good to know. The dreaded bridal track was even more terrifying in darkness and even illuminated by the Cree with its 1800 lumens, it was still able to terrify. At one point poor Anne was almost off her Brompton as we was unable to unclip in time. With this simply awful stretch done we were on road for the rest of the ride. As we neared Bushy Park, local knowledge from Jeremy informed that a pedestrian gate was left unlocked. Sure enough it was. Four Bromptonians entered and cycled through an empty park. It was done in silence and the only sounds were that our bikes made. Just before Richmond we said our goodbyes to Jeremy while the rest of us headed back to Kew. Unfortunately Anne had an incident with a black taxi that was to leave her momentarily shaken. The taxi cut across her and actually made contact with her front wheel. It is a wonder how she managed to stay on her bicycle. It provided some soured notes on an otherwise excellent ride. This was a great little ride. It also came at just the right time. There are several big rides coming up which I have been slowly preparing for. Piddly little rides in and around parks, at a slow pace or where there are few hills of substance just won't provide the prep needed, so I was glad of this one. Essentially I want to be able to participate in these bigger rides without struggling or going too slowly. On Friday night, Saturday morning I will be cycling from London to Brighton. I am not sure the infamous Ditchling Beacon is on the agenda, however if it is I feel ready for it. Another big thank you to David for his excellent navigation and pace setting. You can view the map and ride data by clicking on the link below. Nice write up. Sounded like a good round trip.